South Korea has called the launches "a provocative act"
U.S. diplomat: "This type of North Korea behavior is not helpful"
SEOUL, South Korea (CNN) -- North Korea fired several short-range missiles toward the Sea of Japan on Saturday, an act that the U.S. watched closely and South Korea called provocative. N. Korean army soldiers, back, look at a S. Korean soldier, center, in the demilitarized zone in June. 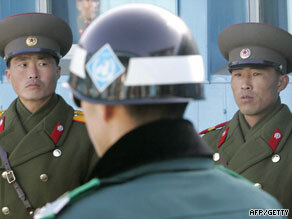 Pyongyang fired six short-range missiles in less than seven hours, South Korea's Foreign Ministry said. The missiles were apparently Scud-type, estimated to have a range of about 500 kilometers (310 miles), according to South Korea's Yonhap news agency. South Korean intelligence estimates that North Korea has about 700 such missiles in its arsenal. Pyongyang test-fired four such missiles off the east coast Thursday, Yonhap reported. South Korea called the launches a provocative act, according to a government statement. North Korea had issued a warning to mariners to avoid an area in the Sea of Japan at certain times between June 24 and July 9 because of a "military firing exercise," according to a U.S. military communication about the warning provided to CNN. The first two missiles were fired about 8 a.m. and 8:30 a.m., Yonhap reported. Another missile was launched about 10:45 a.m., the agency reported. A fourth one came some time after that. The U.S. Navy and other U.S. officials said they are ready to track any missiles. "The United States is aware of possible missile launches by North Korea. We are closely monitoring North Korea's activities and intentions," a U.S. official said. "This type of North Korea behavior is not helpful. What North Korea needs to do is fulfill its international obligations and commitments." Earlier this week analyst Daniel Pinkston said the reported test might be training for a future test but it could also just be a routine military exercise. "It is worrisome to some degree, but it is different from a ballistic missile launch," said Pinkston, of the International Crisis Group in Seoul, South Korea. "It's part of military training, but there seem to be no movements of troops or anything that would suggest preparations for military operations. "So yes, people are watching it, the military is watching it here, but I don't think it's related to any plans or operations to attack anyone."